The reverse of this panel bears a signed label with a hand written inscription: “Le consigné declare que le tableau cicontre paysage d’hiver, vendu à Mr. Weissenbruch est peint par lui. Charly Leickert. Amsterdam 1886. Hauteur 18 Largeur 28 ct.” With this notation Leickert declares that the painting is by his hand, that he painted it in 1886 and was bought by Mr. Weissenbruch. It could be well possible that Jan Weissenbruch (1822-1880), one of the founders of the Hague artist’s society Pulchri, was the buyer of this painting in 1886. Leickert and he knew each other from the period Leickert worked in The Hague. However, there is another Weissenbruch: Jan Hendrik (1824-1903), the two years younger cousin of Jan Weissenbruch. This young painter was invited to study under Schelfhout, just like Leickert. Hague School painter Johannes Bosboom however advised him not to take the Romantic road, an advice Weissenbruch followed. But there is of course a chance that the two painters knew each other and that J.H. Weissenbruch bought this piece in 1886. In the year Leickert painted the panel he lived in Amsterdam and worked in the surrounding area. 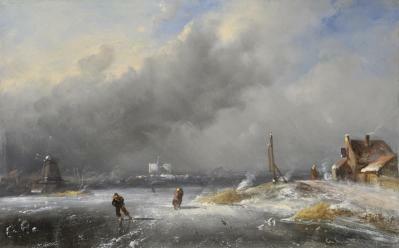 This winter scene shows a river with an upcoming storm and silhouette of a city in the background. It is probably a view of Haarlem, with the Grote of St. Bavo Church in the centre. The river would then be the Spaarne. Nowadays, on the exact same spot, we can still admire a windmill. The Netherlands, Here I Am; 19th century painting from the Artykwariat Gallery, The National Museum in Poznan, Leslie Smith Gallery, and private collectors’, May 5 – June 4, 2011. Artykwariat Gallery, Poznan, Poland. Leickert was trained by Bartholomeus van Hove in The Hague, where he practiced composition and representation of depth in landscapes. He gradually applied himself to painting nature and architecture. 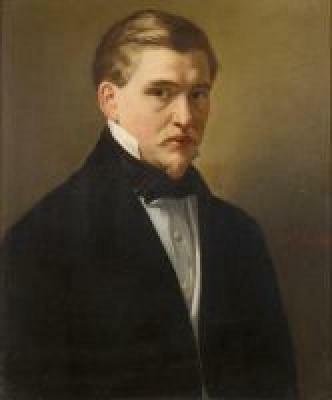 In 1839, at only 23 years of age, Leickert made his debut at the General Exhibition of Dutch living masters in The Hague. A year later he was apprenticed to well-known painter Andreas Schel . . .